The Motorized Wrapping Turntable is a self-contained, portable turntable for wrapping pallets in conjunction with a manual stretch-wrap dispenser. This unit is designed to suit low-volume packing/shipping operations which do not warrant the expense of more sophisticated machines. It replaces manual wrapping and the consequences of operator giddiness, and results in a tighter, safer package. Portability is a major feature of the Motorized Wrapping Turntable. 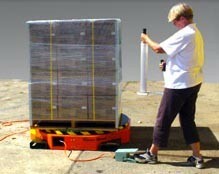 It is fitted with fork pockets, so the machine can be parked in a corner or on a pallet rack when not in use. Motorized Wrapping TurntablePower supply is connected into a flush-mounted appliance inlet, and the foot-operated switch is stowed in a lockable receptacle in the base of the machine. The unit drive consists of a ½ HP capacitor-start, capacitor-run motor, coupled to a worm reducer, driving a shaft-mounted driving wheel. The turntable is supported on the driving wheel and three idler wheels. All drive components are housed within the machine base. A comprehensive User Guide covers all aspects of safety, operation and maintenance. Motorized Wrapping Turntable is designed in accordance with AS4024.1 1996, ‘Safeguarding of Machinery’. Motorized Wrapping Turntable was designed and is manufactured in Australia using local suppliers and staff. No places for fingers to get caught. Everything is self-contained and locked away when not in use. No more dizzy staff from walking around the pallet. Reduces risk of back injuries and tripping. Designed in accordance with AS4024.1 1996, ‘Safeguarding of Machinery’. Eliminates room required to walk around pallet. 3 sides of pallet can be enclosed close to pallet turning circle. A very affordable option for all small businesses. Just plug it in, remove the footswitch and away you go. No special wiring or floor base required. Built-in fork pockets allow Motorized Wrapping Turntable to be easily moved to where-ever it is needed, and when not in use it can be stored in a corner or on pallet racking. Any sized pallet can be used – as pallets can overhang the turntable on all sides. Pallets can be wrapped to a much tighter degree, resulting in a firmly wrapped pallet with less risk of losses or damage during transport. The shaded area represents the area saved when using Motorized Wrapping Turntable compared with the area required for manual wrapping.